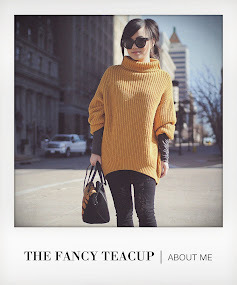 the fancy teacup: color scheme. Something about the summer makes me want to go monochromatic with my wardrobe. Not sure if the strong rays of the sun already uplifts all things of bright hues, or if the heightened temperatures make me want to stay simple in apparel. Either way, it makes my mornings much more efficient pairing the two colors that are the foundation of any palette. I am also keen on open knit tops. Always like the somewhat rocker and airy look of them, which aided to the persona of the summer stroll we took in the artist district in downtown L.A. Even the lightweight shorts that were on the verge of being athletic and lounge wear simultaneously were a nice assistance to cooling down. I LOVE this simple but oh, so cute look. Monochromatic is my kind of thing! Soooo pretty!!! Love the monochromatic look, and the petal shorts are gorgeous!!! Gorgeous! Loving the monochrome on you! It's so simple, yet so dressy and stylish! i love the black and white combination, it's one of my favourites for this summer! lovely outfit! I like matching knit top and those beautiful shorts! perfect! I'm loving the monochromatic thing going on! That cute knit top is great, love how the shoes complete the look perfectly. Those shorts are super cool, love the overlap! Great look too, so chic. I love netted mesh tops. Great summer outfit! Your hair is amazing! The rest of your outfit is too! awesome from head to toe! I love this look! So effortless! Love your outfit! You look great. Oh my gosh gorgeous! Those shorts are adorable! I really do love your shorts! I saw those heels at Zara and really liked them. They look great on you. I like the knit top :) Perfect for summer! Great sweater. Love this look. SUCH A BEAUTIFUL POST! AMAZING PHOTOGRAPHY!!! Love the shorts and heels! They go very well together. Love your outfits! Would love to have you join myStorey and post a "storey" about this to share this outfit with my friends and the entire myStorey community!! That skirt, the bag, the top -everything. Did I mention that I like the bag? Thanks for posting and feel free to drop by me too anytime. that top is everything! LOVE! Beautiful take of the monochrome trend, love everything about this look! I am absolutely loving those shorts - already searching for them to buy. Love your blog - just discovered it! LOVE YOUR BLOG! & love this outfit!